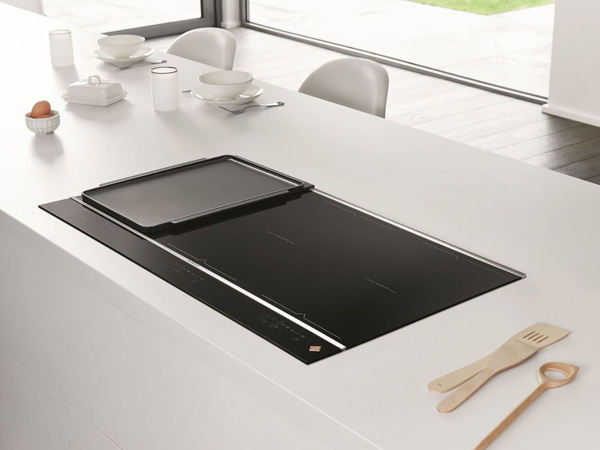 As part of its induction hob offer, De Dietrich has introduced HoriZone,which features zoneless cooking. It means the hob can cater from 100mm pans up to 400mm oval casserole dishes. It comes with a wooden chopping board and can also be customised with a detachable grill or plancha, which fit onto rails on the hob to slide into position when required. In addition, HoriZone boasts safety technology such as anti-overspill, automatic stop and temperature limiter to prevent oil from catching fire. De Dietrich induction hobs come in a choice of colours, including Absolute Black, Platinum, Pure White and Iron Grey.